An absentminded philosopher forgot to wind up the only clock in his house. He had no radio, television, telephone, internet, or any other means of ascertaining the time. He therefore decided to travel by foot to his friend's house, a few miles down a straight desert road. He stayed there for the night and when he came back home the following morning, he was able to set his clock to the correct time. Assuming the philosopher always walks at the same speed, how did he know the exact time upon his return? Note: this is not a trick question. The Philosopher did not bring anything to his friend's house, nor did he bring anything back with him on his trip home. HINT 1: Even when a clock shows the wrong time, it can still measure time afer being wound. HINT 2: We can assume that the journey to his friend's and back took exactly the same amount of time. 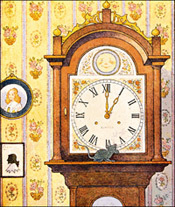 ANSWER: The Philosopher winds the grandfather clock to a random time right before leaving, 9:00 for example. Although this is not the right time, the clock can now be used to measure elapsed time. As soon as he arrives at his friend's house, the Philosopher looks at the time on his friend's clock. Let's say the time is 7:15. He stays overnight and then, before leaving in the morning, he looks at the clock one more time. Let's say the time is now 10:15 (15 hours later). When the Philosopher arrives home, he looks at his grandfather clock. Let's say his clock reads 12:40. By subtracting the time he set it to when he left (9:00) from the current time (12:40) he knows that he has been gone for 15 hours and 40 minutes. He knows that he spent 15 hours at his friends house, so that means he spent 40 minutes walking. Since he walked at the same speed both ways, it took him 20 minutes to walk from his friend's home back to his place. So the correct time to set the clock to in this example would therefore be 10:15 (the time he left his friend's house) + 20 minutes (the time it took him to walk home) = 10:35.